When Wendy Ward started showing previews of her latest book late last year I jumped online and pre-ordered a copy through an online bookstore in Australia. 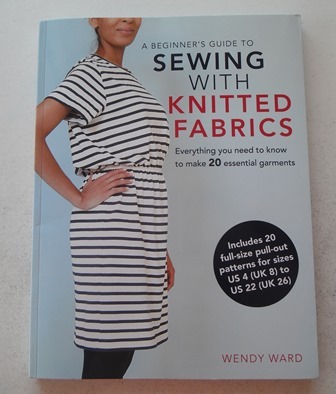 A Beginner’s Guide To Sewing With Knitted Fabrics is Wendy’s 3rd book. My book was delivered the same time that the book was released in the UK (ok maybe even a couple of days earlier than the official release date in the UK) It was one of those from the minute you flick through it you want to make things from it books. 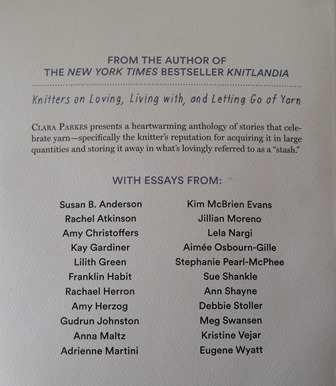 I love sewing with knits so this book was perfect. 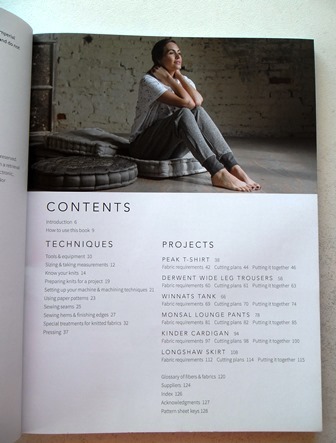 So as the names of the projects suggests you get patterns to make a t-shirt, wide leg pants, tank top, cardigan, skirt and lounge pants which I would say are more like what we call trackie pants in Australia but stylish ones. What I love about this book and all of Wendy’s books really is that she gives you a basic pattern for the garment for example the t-shirt so that if you are a beginner you start with that or even if you are not a beginner anymore it is a wardrobe staple pattern, we all need a good crew neck t-shirt. She then gives detailed step by step instructions on how to alter the base pattern to change the style like turn the t-shirt into a dress. 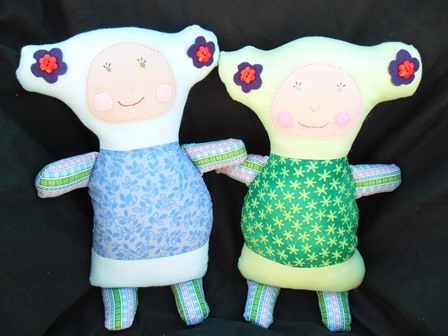 She lists what fabric requirements are needed for each style in every size and the pattern cutting layout on the fabric. These little checklists and visual pictures are a sewing confidence booster so if you are not a seamstress wizard who can visualize things in your head and miraculously than have them turn out the way you want in the end piece you can still give the project ago and it will work. You could do an entire wardrobe for both summer and winter from this book. Some of the projects you can combine to make dresses which can be tank style or long sleeve. You could make both pant styles either as shorts or long pants, you could use lighter weight knits for summer or thicker knits for winter. The cardigan could be short sleeve or long sleeve. This book is very versatile and not just for beginners, experienced knit fabric people will also enjoy it. A note to point out is that I found the pattern sheets in this book a little easier to follow than I did Wendy’s skirt book, there isn’t as many pieces to the patterns in this book I don’t think so visually the pattern sheets looked less cluttered. 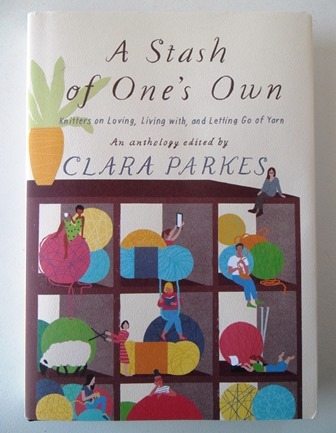 I have been meaning to blog about this book for some time because I have actually made 2 Kinder cardigans already. I’ll post about them in the coming weeks but I will say they were simple to do and are very comfortable. From the previews of the book I thought I would make one or two patterns from it but once I got the book and saw all the patterns and the variations of them I’m now thinking I am going to sew my way through the book like I am the skirt book. Have you ever liked a designers patterns a few times and before you knew it you had become a fan of theirs without realising it? To be honest I can’t remember where I first started seeing Wendy Ward’s designs but now I own 2 of her books and have just seen she has another one recently out. 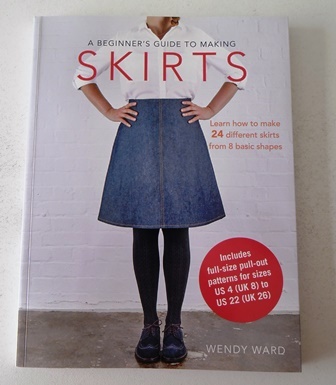 A Beginner’s Guide To Making Skirts is the second book I purchased but the first book that I have made something from as it may have become apparent from my posts I am a bit of a skirt addict so no wonder I have been attracted to this book. 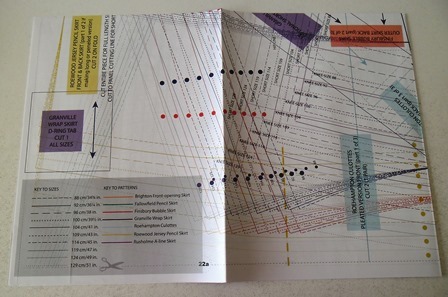 The book contains 8 skirt patterns that can be modified to make 24 different skirts. The instructions go through how to make each basic pattern and then the ways you can modify it. There are a range of fabrics used in the various skirts including denim, jersey, cottons, rayons. The instructions are written with accompanying line drawings pointing out key areas to watch and helpful hints. For each of the skirts there are line drawings of the cutting layout on the fabric. 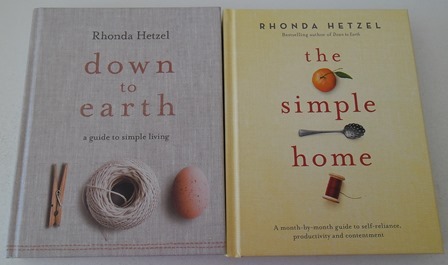 There are also lots of beautiful photos of the finished items. The only slightly confusing part in the book is the printed patterns. Each skirt comes in 10 different sizes and the books comes with pattern pieces for 7 of the skirts (no pattern for the circle skirt as you draft your own) So in theory that is like 70 different skirt pattern pieces all printed on a series 6 pages of paper pullouts. Each skirt is colour coded and all sizes are marked out the same for each pattern so you need to just keep an eye out that you are following the correct colour and size code for the skirt you wish to make. I trace out my patterns on to trace and toile which is fairly transparent but I would not try tracing this out under the normal overhead lighting I have above my craft table as it is a yellowish light instead I would wait until I had enough natural day light that surrounds my craft table so that I could see the pattern markings easier. 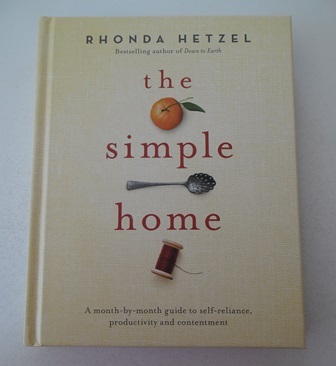 I have made one skirt from this book thus far with plans to make more. It is a great little book to have in your collection demonstrating how you can tweak a basic pattern multiple ways to create different looking items. 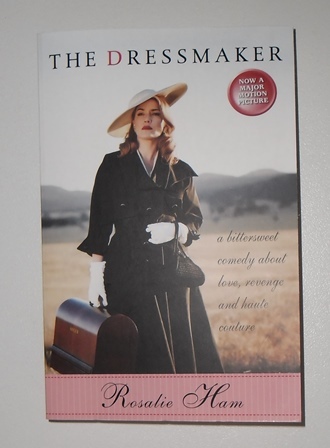 Over this past week I read The Dressmaker by Roaslie Ham so I can tick one thing off my To Craft list this month. I started reading it when I first got the book a few years ago but from where my bookmark was placed it looks like I only read the first few chapters. I started reading it from the beginning again. I think the reason I put it down and never got back to it is that is slow to get in to. There are a lot of different characters and at times I did get a bit confused of who was who. Once the story line got going I found it to be ok, I read some each afternoon but could easily stop and do something and come back to it without needing to rush back to it. Some books I can’t put down or I have to read to the end of the chapter and struggle to put it down for the day, sadly not in this book. Some days I would read to the end of the chapters other days just to the end of the page. There was some moments in the book that I wasn’t expecting so it does have twists in the plot. I liked reading about the characters wearing all their different fabrics and I did try to imagine them in my head and I think that maybe what kept me interested in the book. The ending for me was a little bit unfinished, I could reason with most of the ending but one part made me think why? My overall thoughts are it is an easy read. I think it would be a great book for a holiday where you can pick the book up at your leisure and read some casually. You have to get past the first few chapters which are a little slow but then it gets better and your mind gets lost in a world of fabric and fashion. It is worth the read if you haven’t seen the movie which is my next step. I thought I had brought the dvd but it turns out I hadn’t so I will be getting it this weekend to watch over Easter. From everyone’s thoughts on Instagram the movie is better than the book. Normally I always think that books are better than movies but I think this may be the exception to the rule as I think the clothing and fabrics need to come alive visually and you need the real life expressions in the characters to really understand them. 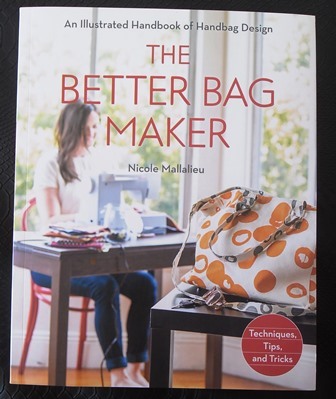 The Better Bag Maker by Nicole Mallalieu has been on my wish list since almost its release in 2014. As I’m trying to reduce the excessive amount of craft books from my stash recently I borrowed a copy of the book from my local library, within 5 minutes of reading I knew I needed my own copy. I’m not a complete novice bag maker I have made 2 messenger bag and numerous tote bags, zipper pouches but within in the first 8 pages alone of this book I had learnt so much. As the front cover suggests this book is full of useful techniques, tips and tricks. There are some great bag makers out there who have wonderful patterns and fantastic instructions / tutorials that go along with their patterns but sometimes they tell you to do a step but don’t tell you useful gadgets that will help you do the step. If your familiar with bag making sometimes you told to trim back the interfacing / stabilizer from the seam to reduce bulk but how do you do that if it has been fused to the fabric? This book explains how and shows you a tool to use. There was another little cutting tool that was mentioned in this book to cut inner points in corners, I wish I had known about this tool when cutting out the box corners on the make-up pouches it would’ve been handy. There are 10 bags in this book that you can make. They start at a beginner level and increase in difficulty with each bag adding another layer of skills but all techniques used are covered in the book. To be honest I’m not sure how many of the bags I will make but I will use all the skills from them on other bag projects I’m doing but also sewing projects. 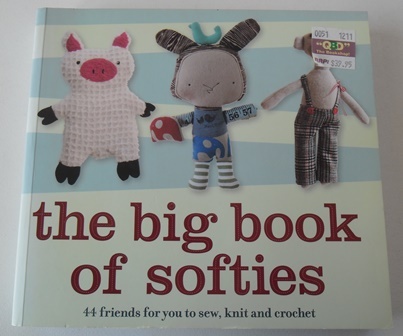 The skills you pick up in this book can be used in any sewing project. Whether you’re a novice bag maker or advanced you will get something out of this book. I’m glad I now have it in my stash.